I have blogged repeatedly about the various options for translating the term campesino. Rural poor, which is one that does not get used often, jumped out at me in the article below, reposted from new matilda. Not all revolutions are created equal. In fact, often the media elevates a protest movement to the status of a revolution, while a mass uprising of the poor and dispossessed receives no attention at all. It all depends, naturally, on who the target of protest is. Neighbouring Latin American countries, Colombia and Venezuela, have both recently been in turmoil. But just five of the 30 deaths occurred at the hands of state security forces, and only two of those were carried out by the National Guard, the forces under the direct command of the socialist federal government. Most of the violence has been carried out by armed radicals on either side of the political divide. Across the border in Colombia, an unreported uprising continues to simmer. 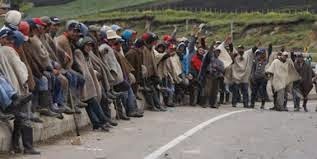 On 17 March, in the capital Bogotá, campesino (rural poor) organisations announced a two-week deadline for the government to implement the agreements that resulted from protests in 2013. “We are tired of the invisible gag put on us by our beloved country, which is now no longer our own,” said Óscar Salazar, spokesperson for the negotiating committee of campesino organisations. The massive Colombian uprising of August-September 2013 was scarcely covered in the English-language media and its rumblings this year haven’t yet been mentioned. On 12 August last year an estimated 250,000 campesinos went on strike and set up road blockades across the country. For weeks, the principal highways were blocked in the provinces surrounding the capital, Bogotá, and blockades were also set up around the major cities Cali and Medellín. All transport with Ecuador to the south was blocked by barricades in the provinces of Cauca and Nariño. Indigenous Amazonians shut down Putumayo province in the far south and blockades in Barranquilla in the far north stopped commerce with Caribbean ports. The central demand of the Colombian campesinos was for guarantees of fair prices for agricultural products and in particular, the cancellation of the Free Trade Agreements (FTAs) with USA and the EU. The FTAs removed import tariffs but placed no restrictions on subsidies in rich countries, thereby allowing agribusiness to sell commodities in Colombia at obscenely low prices. FTA provisions also included the compulsory registration of seeds nation-wide, a move that paves the way for US agribusiness to corner the market with patented seed varieties. In Huila, 70 tonnes of rice harvested from unregistered seeds was seized from campesinos and dumped — this in a country with a poverty rate of 32 per cent. Following the initial blockades, the uprising became a lightning rod for dissent, spreading in urban areas to unions of teachers, health workers, students, transport sector workers and miners. At the height of the uprising, on 29 August, Colombian President Juan Manuel Santos militarised Bogotá and mobilised 50,000 troops across the country. During the month-long uprising, organisers say 19 people were killed by government security forces and over 600 were injured. More ominously, the left-wing opposition has since suffered targeted attacks. Marcha Patriótica, a central protagonist of the uprising, has lost 29 of its organisers to assassinations since the 2013 uprising ended. Unlike in Venezuela, the protestors are receiving the full brunt of the violence. Colombia’s campesinos are attempting to change a system of entrenched privilege. For example, the Minister of Agriculture, with whom campesino leaders are expected to negotiate, was until 2013 general manager of a company with some of the largest holdings of palm-oil and rubber plantations in the Colombian Amazon. By contrast, the Venezuelan protests are backed primarily by the Chamber of Commerce and students of private universities. Over the past 15 years, the socialist government they are targeting has eroded entrenched privileges and given black and mixed-race Venezuelans a role in deciding the future of their country. The English-language press rarely tells this story of Venezuela, instead painting a picture of economic collapse with no mention of the dramatic reduction in poverty and the establishment of universal education and healthcare. By contrast, the Colombian uprising, still far from over, presents a systematic alternative to the pro-corporate policies being forced onto vast stretches of the planet via Washington’s Trans-Pacific Partnership and its Latin American correlate, the Alliance of the Pacific. “It should be the people and communities who order territory and lay out the different ways to make use of it,” agreed campesino organisations at the national summit on 17 March. They call for “the exercise of sovereignty” in place of the dictates of the international market. Comparing Colombia and Venezuela shows whose side our major media outlets are on. We need to be careful whose revolution we are cheerleading.